Remember those days when you could spend hours at the arcade, shooting zombies and playing air hockey with your closest friends? Just because you are all grown up now does not mean that you cannot play those games any longer. It just means that you have to change where you play them. A little-used garage or basement could easily be turned into a game room or rec room. 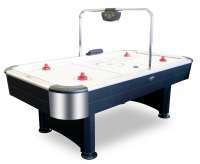 Air hockey tables can be kept in the backyard under an awning, or in the corner of a large living room. The glory and competition of playing games is not as unattainable as you may think. Fun is just at your fingertips. Imagine it is a holiday weekend.Your family and friends are gathered at your house for a barbecue. You need fun games and activities to keep everyone happy and entertained. Yes, you could bury some horseshoe stakes or hit some baseballs into your neighbors’ yards, but with the addition of an air hockey table you have something more fun and interesting for you and your guests. The table can be indoors or under an awning so the game is playable in the rain and after the sun sets, and it is far more entertaining than the usual indoor card games and board games. Best of all, with a game of air hockey you can bring out the competitive edge in anyone.Nothing completes a good barbecue like shouts of glory, cries of defeat, and the flying obscenities and trash talk from Grandpa as he loses to your nine-year-old cousin Jimmy. With an air hockey table in your backyard or rec room, you can host your own tournaments. Invite some friends, family, or coworkers over and have some food, drinks, and a little friendly competition. You can create singles or doubles tournaments, eliminate losers, and name champions. During any sport’s season you can have mini tournaments between games and during commercials and breaks. Your home will be host to events that people will not want to miss.A well-rounded, responsible adult is not complete without acknowledging your inner child.There is a part of you that wants to laugh, play, and just have fun. Game playing can help you express that side of yourself, and bring it out in your friends.Playing air hockey is a fun and healthy way to keep you vitalized, happy, and a little competitive. It is also an active and energetic game, a great way to get a bit of exercise without putting on gym shorts. Plus, air hockey is a strategic game. Once you have played a few games you will notice the strengths and weaknesses in your opponents, and you can use that strategy to defeat your friends and family. 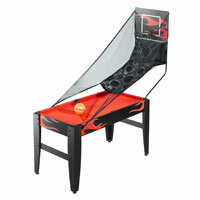 Stimulating the body and the mind, an air hockey table is a perfect addition to the game room or rec room. It is also a great excuse to have fun, hang out with friends, and cackle with delight as you beat them all at air hockey.